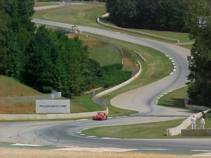 by Dave Hinton Its a Tradition in early fall to head to Road Atlanta for the Historic Sportscar Racing Atlanta Historics,this great track is set in the hills of northern Georgia and is owned by DR Don Panoz who has spent millions over the last few years turning this track into a world class facility. Bill,Tari and the newly weds Trent and Val Terry drove down from Benton Ill to CO-drive in the 1 hour Rolex Endurance race with Larry Ligas in the Predator XKE coupe. Bill Terry had just shipped the engine back to Predator after a mid season check over. The Enduro was due to start Saturday afternoon at 5.00pm.Larry had qualified in third place behind John Bourasso Porsche 911 and Eric Bretzels pole sitting 911, starting alongside Larry was Zac in his Lotus 23 sports racer. As soon as the green flag dropped Larry stuck the Jag right behind the lead Porsches, after the 3rd lap Larry managed to Get by the Bourasso 911 and was chasing Bretzel in the lead Kraut-wagon. On the 6th lap Larry had a big spin going down the Esses,when he finally got himself and the car turned around he had dropped down to 9 Th. place overall. Over the next 7 laps Larry drove his heart out and got the jag back up to third place right before the caution came out, Larry headed down pit lane were Trent and the Predator Team waited to refuel and change drivers. With Trent now strapped in the blue XKE coupe we were in 2 ND place overall due to Borasso leaving pitlane 2 minuets to early.Trent immediately started pulling away from the third place Lotus and was making up ground on Bretzel's Porsche. 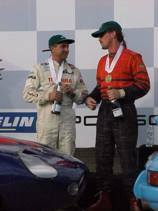 When the checked flag dropped after 1 hour Larry and Trent finished 2nd overall 1.5 seconds ahead of Borassos Porsche. They also took 1st in class with a full lap lead on 2nd place Mustang. The whole Predator/Terry's racing team waited in victory lane for Trent and Larry to receive the medals and Rolex hats and that very important bottle of Champaign, which Trent and Larry emptied over Bill's head. The Rolex vintage enduro started at 12.00 noon on Sunday, David Hinton qualified the 1952 Jaguar XK120 in second place behind a Porsche 914 and ahead of Brian Johnson's Royale sports racer. The red xk120 was once again the oldest car in the race. David used all the Terry's horsepower to take the lead going in to turn1 but the superior handling and braking of the Porsches and Royales soon started giving the Jag trouble by the end of the 2nd lap the Jag was down to 3rd place overall, David had a great dice with Rolex points leader Lee Buell before the royale passed the Jag for good on the 6th lap. At about the halfway point in the race David came around the sharp left turn 7 turn to find Brian shaking his car at the side of the track, turned out he had run out of gas. David finally pitted with only 20 minuets left in the race. Larry and the rest of the Predator team refueled the car and the driver and sent him out to finish the last 15mins of the race. When the race was over David headed to victory lane to claim his 3rd place overall and first in class medals.